The weather is nice and warm so no excuses not to join us this Sunday for a fabulous ride in our lovely local countryside. Three rides on offer, so something to suit all abilities. 9am start, 50 mile Dave “No real hills” Howe route. 10am start, 29 mile route to Stewkley. As always, please bring a copy of your chosen route. We depart from the Rose and Crown in Ivinghoe. These continue to be popular but not everyone is aware that there usually are at least a couple of groups riding at different paces. We depart from the roundabout in Pitstone (the one near the cricket green) at 6:30pm. There is a regular off-road ride that departs each Thursday at 7:30pm. We usually head up in to Ashridge or Tring park for some fun on the trails. We welcome new people so please do come along if you fancy something different from the normal road bike stuff. … over the next couple of weeks, we thought we’d try something a little different! However, we are becoming a bigger group and, as we need to split into 2 groups in the interests of road safety, we thought we would try a slightly different approach. “Officially-like”…. So, starting tomorrow (assuming there are a number of people out! ), there will be 2 groups, a “Regular” group (averaging 10mph, sticking together) and a “Longer Stronger” group. This second group will follow the same Tea Ride stick together approach, will average 11-13mph, depending on the group members, and follow a slightly different, probably longer route. The idea is that both groups will meet at the same Tea Stop, around the same time and reconvene at the pub afterwards, with the option of changing groups at the Tea Stop should you wish. Each group will have a nominated leader, who should not be overtaken. “As fast as the slowest rider” forever will stand. Departing the Rose & Crown, Saturdays, at 10am. Starting Monday 6th July, Elke will be leading out a Roads & Tracks / Off-Road for Beginners ride. The idea being an intro to paths and tracks, doing something a bit different, building a bit of confidence and seeing the countryside from different tracks. Hybrids, Mountain bikes, tourers, BMXs, etc all welcome – road bikes not recommended! Meet at Pitstone roundabout for a 7pm departure. Meet at the Rose and Crown with raincoats for tea and cake and cycling. Time is running out if you want to secure a piece of the newly designed club kit for the summer. The current order closes early on Tuesday so please do place your order by Monday evening at the latest. The details of how to order are in our post from last Tuesday. There has been some discussion on the Facebook Velos Rear Hub about riding the L’Etape London which takes place at the end of September. If you do enter and would like to start at the same time as other Velos, please answer the registration question Which Club do you represent at this event (if any)? with “Ivinghoe Velos” as we think this will ensure allocation to the same wave. Three on offer again this week including a brand new long early start route that takes us to Oxford ! Tomorrow would have been (or is?) WB Yeats 150th birthday. So, in true Tea Ride style, we shall be on a birthday excursion. Any preference as to where? Where’s the Tea Ride’s idea of paradise then? With our wits about us, listening ears switched on and keeping an eye out over our shoulder for “things” coming up behind us….. we leave the Rose and Crown at 10am and we are PEDALLING TO PARADISE. Which basically means “Tea & Cake”. We would like to say a big thank you to all the traffic stoppers & directors, sun blockers, ambulance callers, etc etc for their help on Saturday. Also huge thanks to the car drivers at the scene for their concise reports & video evidence that clear the Velos of any responsibility for the incident. It is a bit late in the day but just a reminder that we have a Tuesday ride leaving from Pitstone Roundabout at 6:30pm. The route will be made up when we gather. Due to popular demand we have opened another Club Kit Order which has a closing date of the 16th June. Please use your email address and the password you created last time. 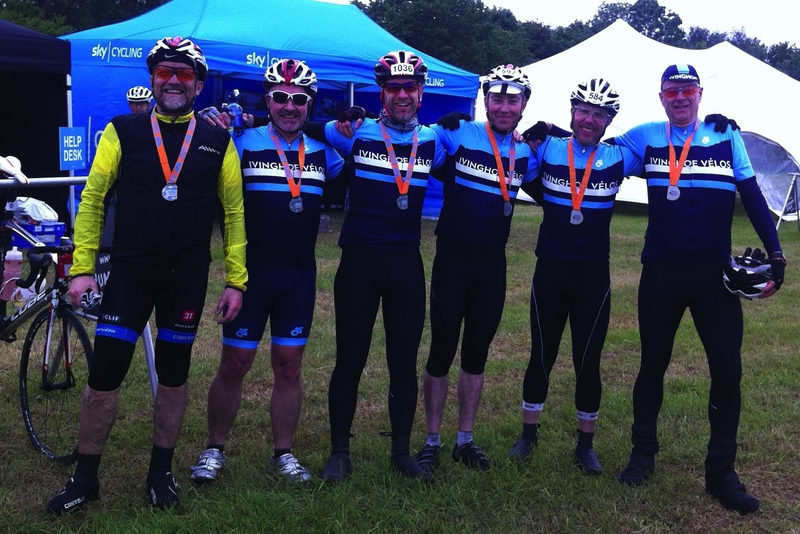 Congratulations to our members who completed the Chiltern 100 last weekend. It is known as the toughest sportive close to the capital and it certainly lived up to that reputation. The weather was awful and the hills relentless but the Ivinghoe Velos who entered it put in a truly epic amount of effort to finish it. Well done to David, Mark, Martin, Jeremy, James, John, Peter and both of the Richards. One of our intrepid tea riders was knocked off her bike today (Saturday) … by another cyclist (not one of ours though). He decided to overtake her on a bend and panicked when he was presented with an on coming car. Thankfully it looks like our injured team mate is bruised but not broken and after hospital treatment is recovering back at home. Hopefully the chap who made the daft manoeuvre has learnt a lesson that we all need reminding of – we need to take the same precautions when we are cycling as we want from cars: – don’t overtake unless you are 100% certain of getting past and bear in mind something may appear in front of you travelling the opposite way. We wish our injured velo a speedy recovery. A number of the velos are planning on riding the Tour de Vale ride and are going to ride to the start. If you are already signed up or plan to register on the day, you can join the other velos departing from Pitstone Roundabout at 8:30am. For those not partaking, we have two rides to choose from on Sunday. 10am start, 32 mile route via Hartwell. 10am start, 19 mile route via Totternhoe. A number of velos have entered the Evoke sportive which takes place next Sunday. It starts in Gaddesden so is another good candidate for riding over there as a group. It includes the final stage of the Womens Tour of Britain route that they will ride on the 21st of June and is graded level 2 – so it shouldn’t be a real toughie. If you do fancy it and want some company for the cycle to the start, please head on over to the Ivinghoe Velos Rear Hub Facebook group to arrange a start time that suits you best. Meet at the pub for a mystery tea ride.